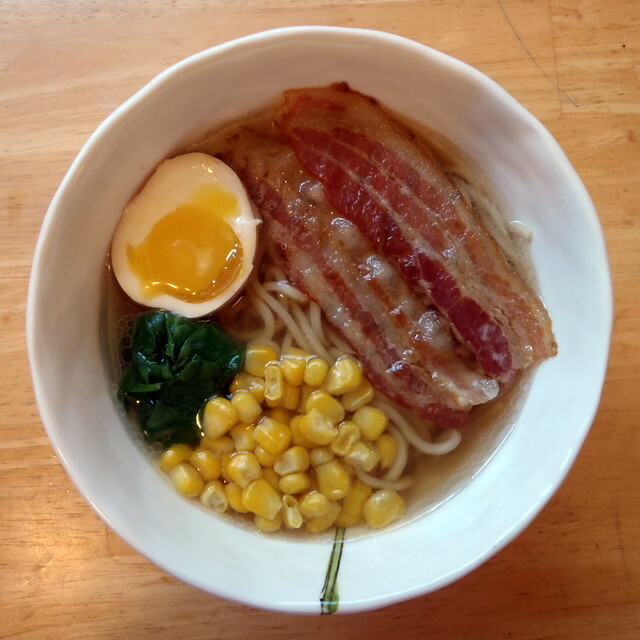 After I made the miso ramen, I decided to try to make a bacon version. 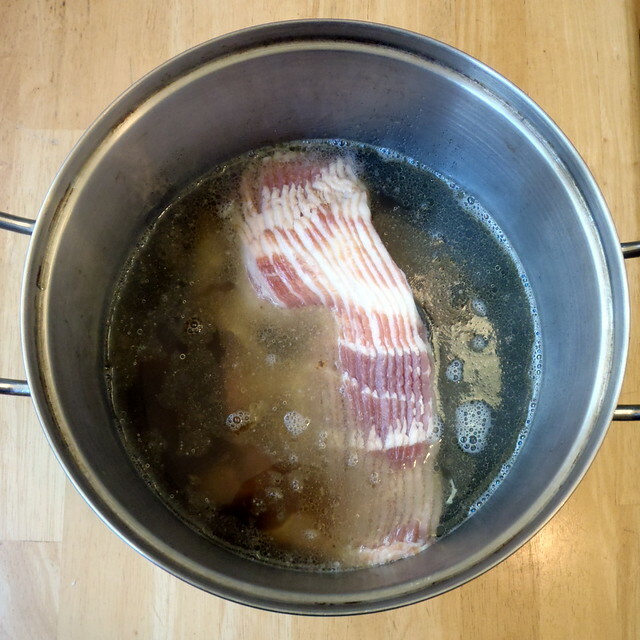 I fried up some bacon, added bacon grease to the broth, and even added some smoked salt, but I just couldn't get the depth of flavor that I was looking for. So I decided to try making Momofuku's ramen broth. After all, it used bacon as one of the ingredients so it must be on the right track. 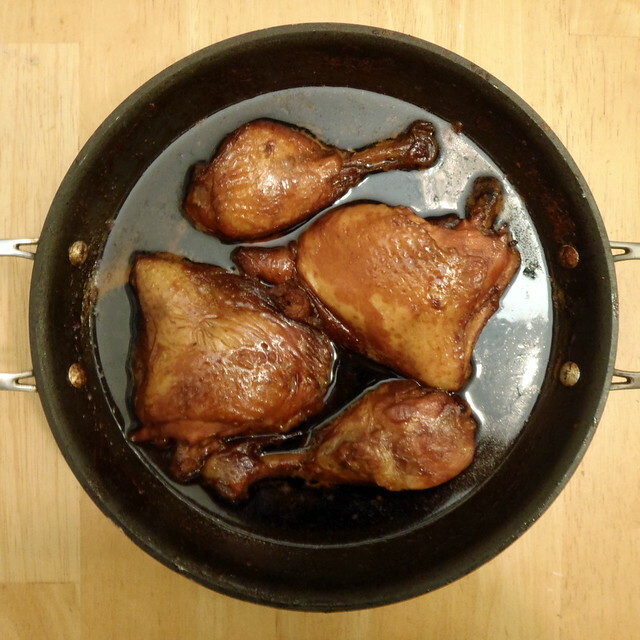 What I love about this recipe is that it builds layers and layers of umami using multiple ingredients: kombu, shiitake mushrooms, chicken bones, roast pork bones, and finally tare, a soy based barbecue sauce made with roast chicken bones. By the end, you get a super rich and flavorful broth that surprisingly isn't very heavy at all. The first step is to make the tare. This recipe will make more than you need, but you can also use it to season just about anything you'd normally use soy sauce for. I've added it to the filling for dumplings, and it would be excellent as a basting sauce for grilled meats. Preheat the oven to 450°F. Using a butcher knife, butcher the chicken legs into the thigh piece and drumstick. 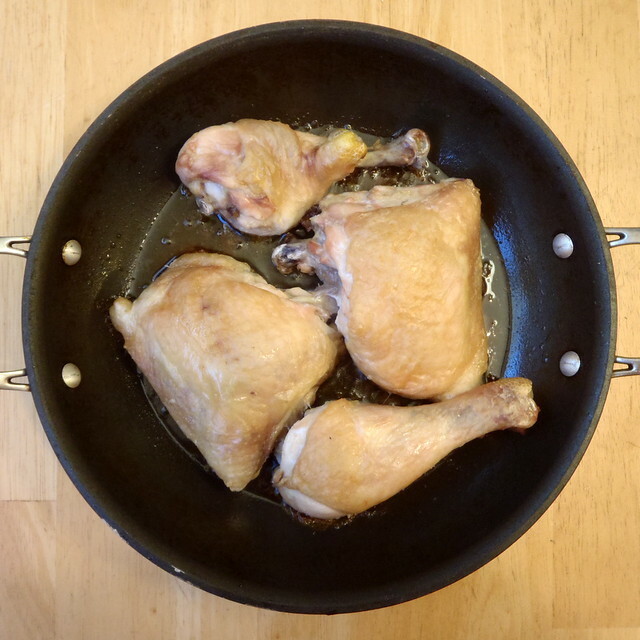 Place the thighs and drumsticks onto an oven-proof pan and roast for about 45 minutes, or until nicely browned, but not burnt. 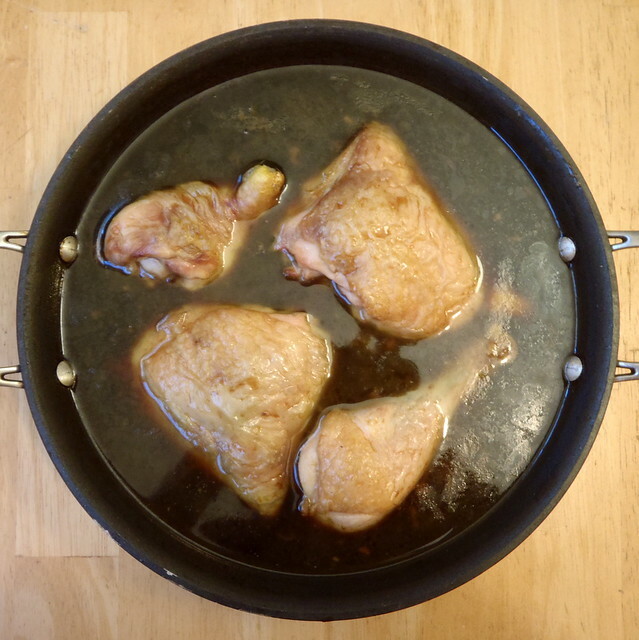 Remove the pan from the oven and place on medium high on the stove. Add a splash of the soy sauce, and once it starts boiling, scrape up all the caramelized fond from the bottom of the pan with a spatula. Add the rest of the ingredients and once it starts boiling, reduce the heat, and let it simmer for about an hour. Strain out the chicken and store the tare in a jar. It'll keep for a few days in the fridge or longer in the freezer. I like to keep a little of the fat on top to help seal off the top and preserve the sauce better. Now it's time to make the broth. I halved the recipe from the book because I was short on some of the ingredients, but I would suggest making the full amount since it's the same amount of work, and the broth freezes well. I've also found that when refrigerated, the broth will form an aspic, so you can also use it to make xiao long bao. 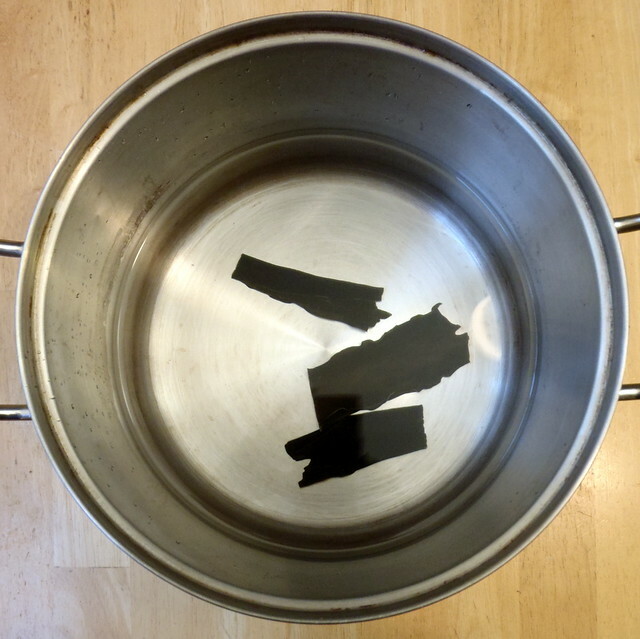 Add the kombu to 3 quarts of water in a large pot. Turn the heat on high, and just before it boils, turn off the heat and let sit for 10 minutes. 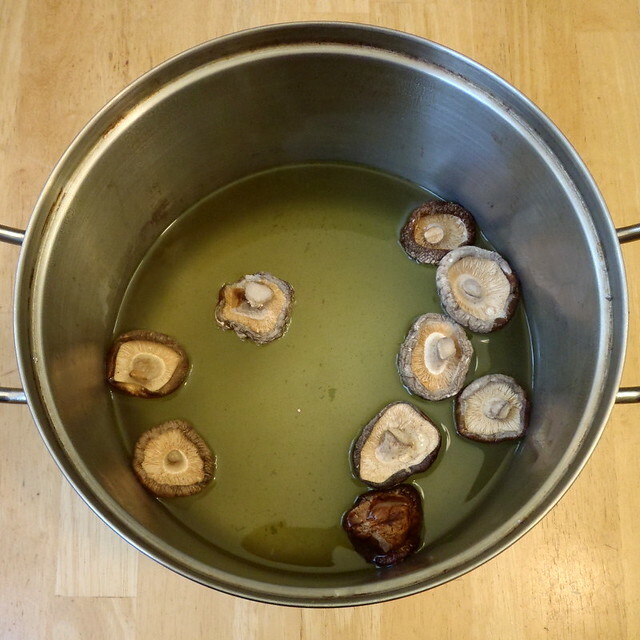 Remove the kombu with a slotted spoon and add the dried shiitake mushrooms. Bring the water to a boil and then reduce the heat and let simmer for 30 minutes. 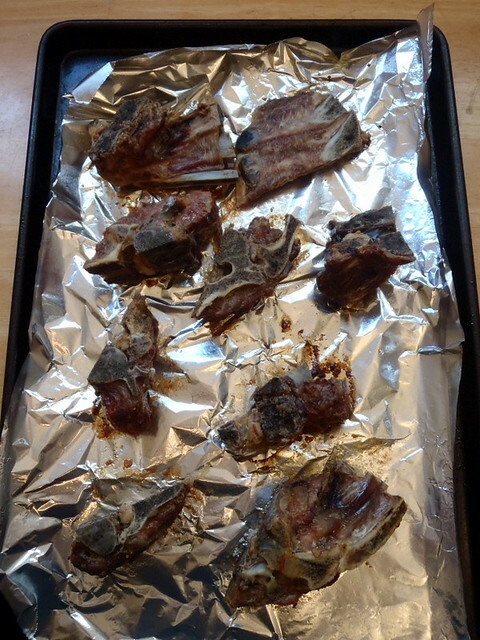 Meanwhile, place the pork neck bones on a baking tray and roast in the oven for 60 minutes, flipping half way through. 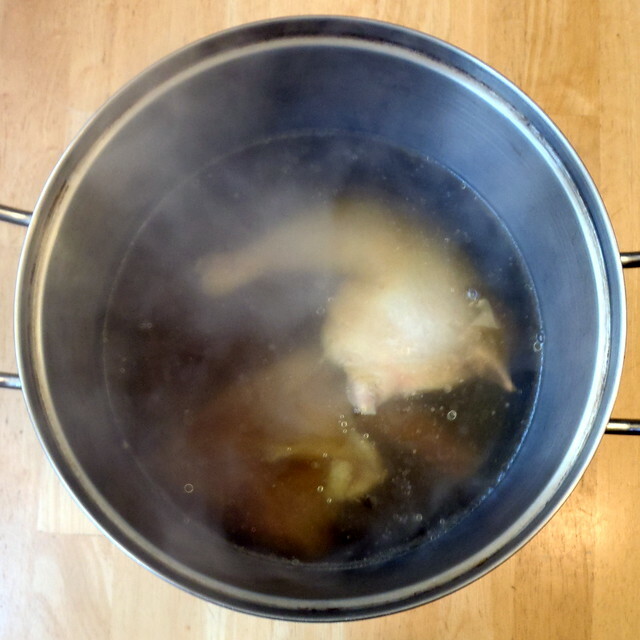 Remove the mushrooms from the broth with a slotted spoon and add the chicken legs. Continue to simmer for an hour, skimming off any of the crud that floats to the top. 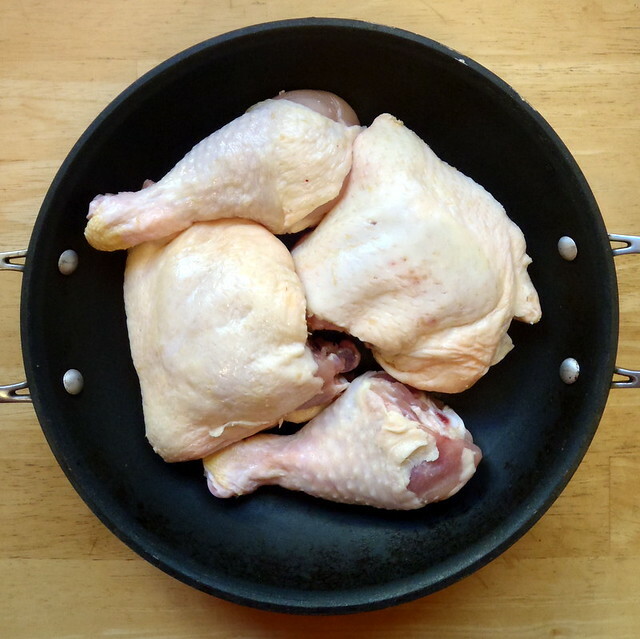 After an hour, check the chicken to make sure that it is cooked through and the meat is falling off the bones. At that point, remove from the broth and add the bacon and pork bones. Continue to simmer, adding more water if necessary. After 45 minutes, remove the bacon. Continue to simmer for 5-8 hours. About 45 minutes before you are done, add the scallions, onion, and carrot pieces. After simmering for 45 minutes, strain everything out. 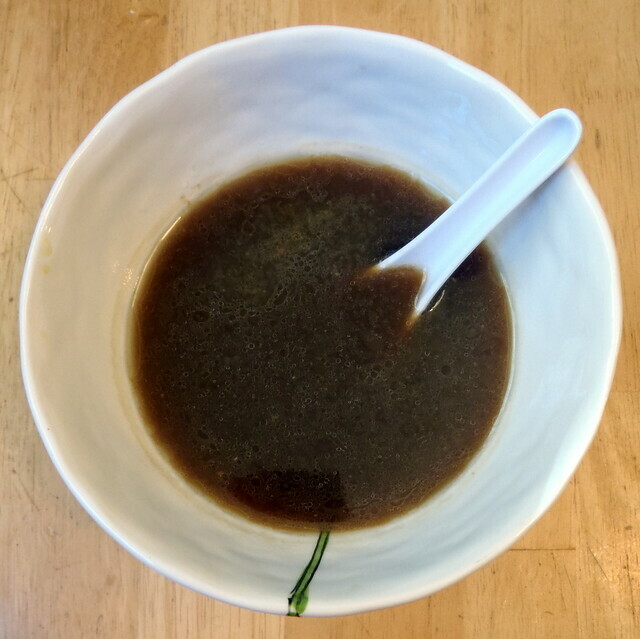 If you are using your broth right away, add 1/4 cup of the tare and taste your broth. David Chang recommends seasoning it until it is almost at but just under "too salty". 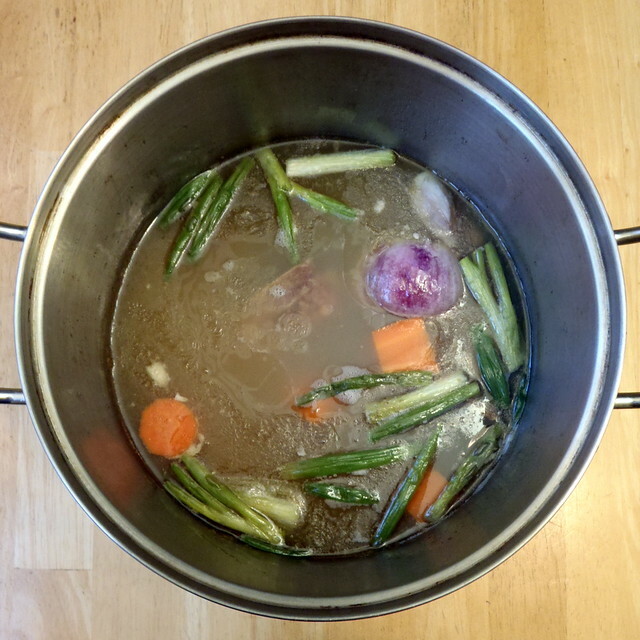 If not using your broth immediately, you can turn the heat on high and reduce the volume in half. Store in the refrigerator (if using within a few days) or the freezer. When ready to use, heat it up again and add an equal volume of water. Season with the tare to taste. 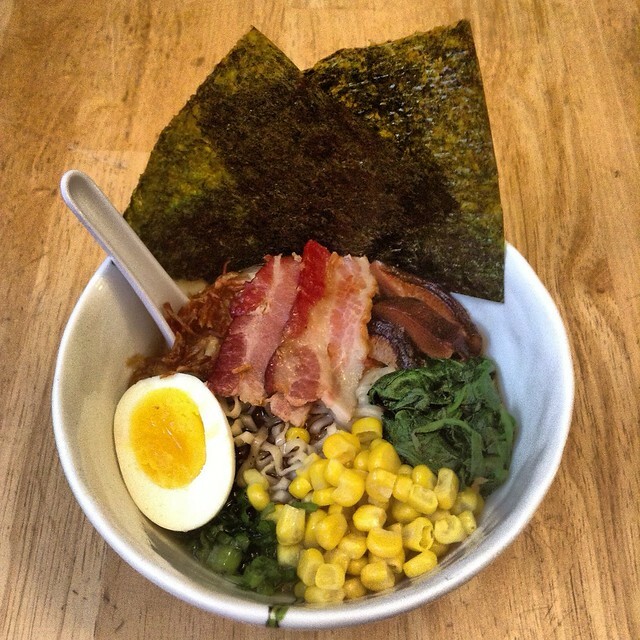 For my bacon ramen, I topped the Momofuku ramen broth and homemade ramen noodles with some fried bacon, blanched spinach, corn kernels, chopped scallion, a soft-boiled egg, and nori. I still felt like it was missing a little something, so I added some fried shallots, which turned out to be the perfect touch. I have to say, I'm glad you're back. I've been following your blog since 2010 and was sad about the long break you took. I'm an Asian American mom and love all of your Asian and American recipes. Keep it up! Silly question but what did you end up doing with the chicken from the Tare? For the Tare do you think just chicken bones with a little meat on them would be better? For the tare, I got chicken feet from the local farmers' market - cheap!! Much cheaper than leg quarters. I cooked them for several hours, splashing water on frequently until all the cartilage dissolved. My tare, once refrigerated, was a solid jello block of umami goodness! Good afternoon. 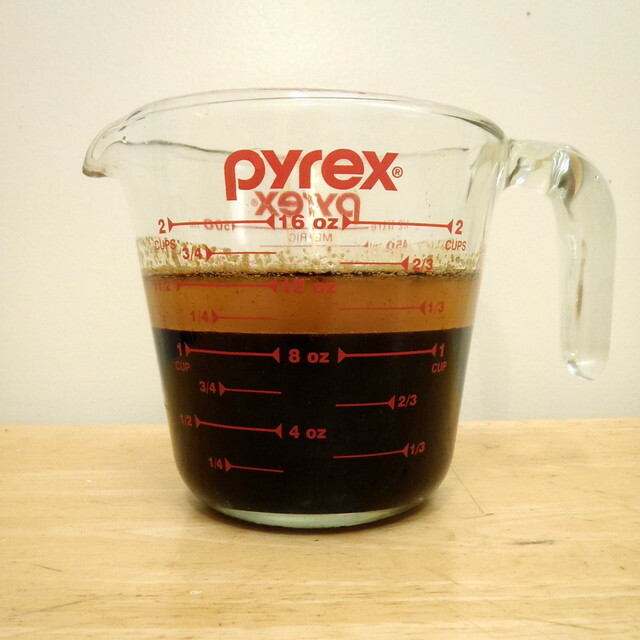 Is the "splash" of soy sauce the full cup? Thanks! No, you just want to add a "splash" first, maybe a few tablespoons to deglaze the pan before adding the rest of the soy sauce. The picture doesn't really show that, sorry! Are you to throw away the caramelized fond that was scraped up? No, the fond should dissolve into the liquid; you're basically deglazing the pan.